The launch ceremony of the Lagoon 620 yacht "Yalong" and opening ceremony of Yalong Bay Lagoon Club were held at Yalong Bay Yacht Club, Sanya on 2nd Feb.
Yalong Bay Yacht Club is a high-end recreational resort yacht club invested in by COFCO Hainan Investment Development Co., Ltd. There are 150 yacht berths which can accommodate yachts ranging from 50 feet to 200 feet long. With its international terminal facilities and professional one-stop chamberlain services, the club is sure to become one of the most popular destinations for yacht enthusiasts from around the world. 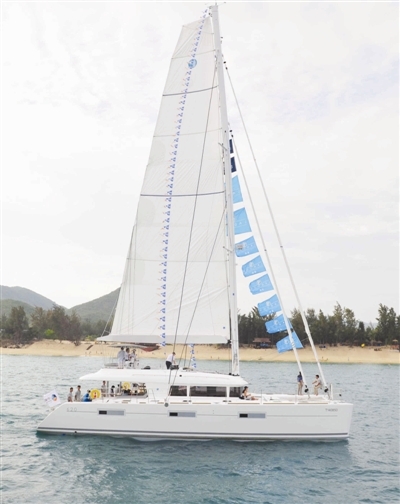 The Lagoon 620 yacht ‘Yalong’, which is constructed by Lagoon, the world leader in the construction of cruising catamarans, has been purchased by Yalong Bay Yacht Club from Simpson Marine, Asia’s Leading International Yacht Dealership & Brokerage since 1984. As a Chinese agent of the Lagoon brand, Simpson Marine established a Lagoon Shipowners Club in Yalong Bay Yacht Club on the day, and the event gathered many Lagoon yachts including two Lagoon 620 yachts, a Lagoon 500 yacht, a Lagoon 440 yacht, a Lagoon 420 yacht and a Lagoon 400 yacht.